La Pine is a city in Deschutes County, Oregon, United States, incorporated on December 7, 2006. La Pine is part of the Bend, Oregon Metropolitan Statistical Area. The population was 1,653 at the 2010 census. La Pine is in an isolated area of Central Oregon, consisting of a loose collection of homes and businesses along U.S. Highway 97 about 30 miles (48 km) southwest of Bend. Most of the residential development is concealed from the highway itself. Several peaks of the Cascade Range are prominently visible from the community. La Pine is in the valley of the Little Deschutes River, a tributary of the Deschutes River. The river provides recreational opportunities such as fishing, swimming, canoeing and other leisure activities. La Pine was founded in the 19th century with Huntington Road as the main street. The fledgling community quickly grew and prospered until the combination of a failed community water system and rapid growth of Bend caused a slowdown to occur. Today, La Pine is beginning to grow once again, but this time as a commuter town to Bend, making Deschutes County one of the fastest-growing counties in America. La Pine had remained an unincorporated community for many years. A measure to incorporate in the 2000 elections was rejected by a 2–1 ratio. 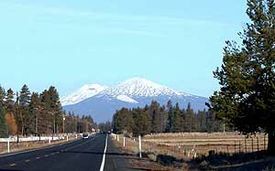 In the elections of 2006, another incorporation measure was placed on the ballot (one of two such measures in Oregon that year; the other being for Bull Mountain, Oregon). The La Pine measure passed, creating the City of La Pine. The city occupies 7 square miles (18 km2), and at the time of incorporation, had 1,585 residents as of December 2006. Much of the former census-designated area lies outside the city limits. According to the United States Census Bureau, the city has a total area of 6.98 square miles (18.08 km2), all of it land. As of the census of 2010, there were 1,653 people, 698 households, and 412 families residing in the city. The population density was 236.8 inhabitants per square mile (91.4/km2). There were 942 housing units at an average density of 135.0 per square mile (52.1/km2). The racial makeup of the city was 93.5% White, 0.2% African American, 1.1% Native American, 0.2% Asian, 0.1% Pacific Islander, 1.8% from other races, and 3.0% from two or more races. Hispanic or Latino of any race were 5.8% of the population. There were 698 households of which 28.5% had children under the age of 18 living with them, 42.6% were married couples living together, 11.6% had a female householder with no husband present, 4.9% had a male householder with no wife present, and 41.0% were non-families. 31.2% of all households were made up of individuals and 15.5% had someone living alone who was 65 years of age or older. The average household size was 2.30 and the average family size was 2.87. The median age in the city was 43.6 years. 22.4% of residents were under the age of 18; 6.8% were between the ages of 18 and 24; 22.7% were from 25 to 44; 30.4% were from 45 to 64; and 17.8% were 65 years of age or older. The gender makeup of the city was 48.4% male and 51.6% female. As of the census of 2000, there were 5,799 people, 2,331 households, and 1,699 families residing in the CDP. The population density was 197.7 people per square mile (76.3/km²). There were 2,975 housing units at an average density of 101.4 per square mile (39.2/km²). The racial makeup of the CDP was 95.84% White, 0.09% African American, 1.28% Native American, 0.24% Asian, 0.10% Pacific Islander, 0.55% from other races, and 1.90% from two or more races. Hispanic or Latino of any race were 2.22% of the population. There were 2,331 households out of which 26.6% had children under the age of 18 living with them, 61.3% were married couples living together, 7.3% had a female householder with no husband present, and 27.1% were non-families. 20.8% of all households were made up of individuals and 10.3% had someone living alone who was 65 years of age or older. The average household size was 2.47 and the average family size was 2.82. In the CDP, the population was spread out with 23.0% under the age of 18, 4.9% from 18 to 24, 22.5% from 25 to 44, 28.8% from 45 to 64, and 20.7% who were 65 years of age or older. The median age was 45 years. For every 100 females, there were 99.8 males. For every 100 females age 18 and over, there were 98.7 males. The median income for a household in the CDP was $29,859, and the median income for a family was $33,938. Males had a median income of $30,457 versus $20,186 for females. The per capita income for the CDP was $15,543. About 9.5% of families and 13.2% of the population were below the poverty line, including 13.4% of those under age 18 and 11.5% of those age 65 or over. La Pine schools are part of the Bend-La Pine School District. ^ Population Estimates Boundary Changes Archived 2006-02-06 at the Wayback Machine, United States Census Bureau, 2007-07-01. Accessed 2008-11-06. ^ "La Pine: Incorporation measure is headed to passage", The Oregonian, November 5, 2006, pg. A4. ^ Population Research Center. Portland State University. Retrieved October 5, 2007. This page was last edited on 12 November 2018, at 19:22 (UTC).